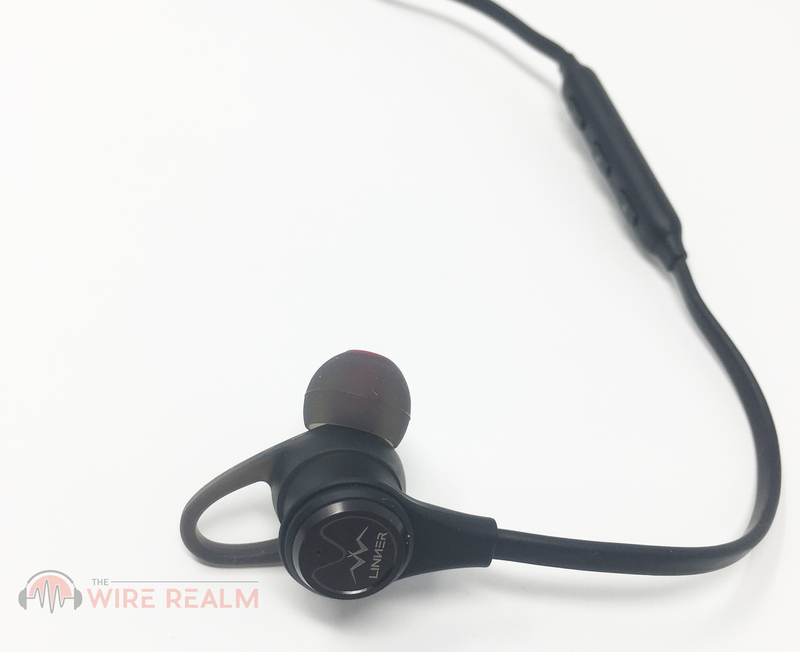 As we continue to review the many popular models of headphones in the market today, we’re met with a very effective pair of noise-cancellation in-ears for this one, the Linner NC50. 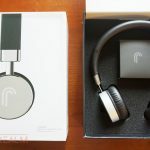 Linner sent us a pair of these Bluetooth headphones to write a fair and honest review, and seeing it was rated quite highly on a few different retail websites, we wanted to see what it was all about. 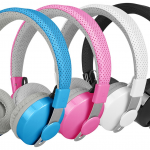 Coming in at an affordable price-point considering these have actual active noise-cancellation technology, sweat proof and a great wireless Bluetooth playing time of about 12 hours (yes, BT 4.1), we were excited to give it a go. Here are our thoughts today. 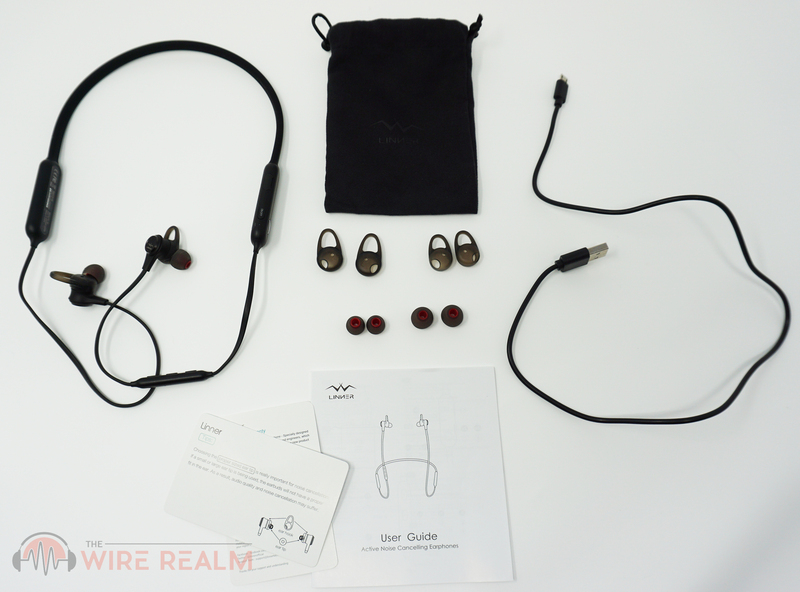 When first unboxing the Linner NC50, we were glad to see at least some type of protective pouch included, especially since in-ear headphones, in particular Bluetooth as well as active noise-cancellation (will be labeled ANC from now on) are meant for traveling. The pouch isn’t leather or soft cloth, but merely a standard material here, which isn’t a big deal in our opinion. They’ll keep your headphones safe in most situations, unless of course you smash them somehow (it isn’t hard shell). You can also fit your replacement ear tips in here easily, and perhaps a few more objects you need to carry along with you. You do need to bend the neck-band a bit awkwardly to make the NC50 actually fit in the case, and we’d recommend putting in your replacement ear tips first so they don’t fall out, since there’s a slight hole at the top even if you pull the strings as tight as you can. Ultimately, we recommend just keeping the replacement ear tips and sport tips at home so you don’t risk losing them. 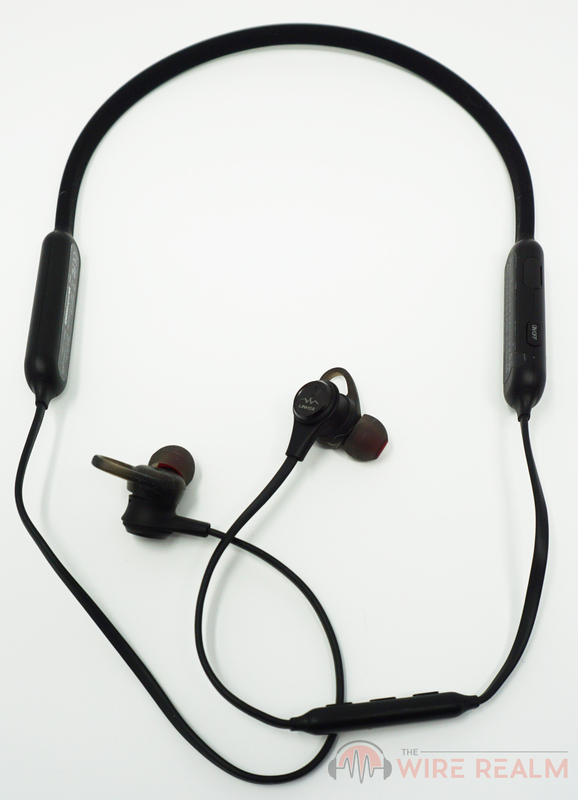 In terms of the headphones themselves, we have a nice rubberized and very flexible neckband. We bent it forward and backward and had no problems with it — no breaking, scratching or displacement here. The cables are a standard make and aren’t rope or anything, but do not break when pulled apart or bent. 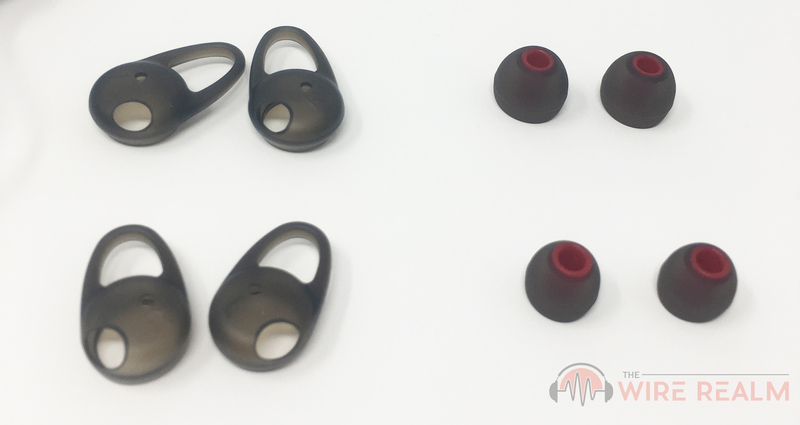 The headphones themselves are a harder plastic (no, no metal build here) and do not scratch when we tried to do so, while the ear tips and in-ear hooks are a decent-quality rubber that won’t tear apart easily. The fit is comfortable and the in-ear tips hold in place very well, especially with the sport tips that have a little “fin” that’s a nice soft plastic to poke into your outer ear for extra safety and support. 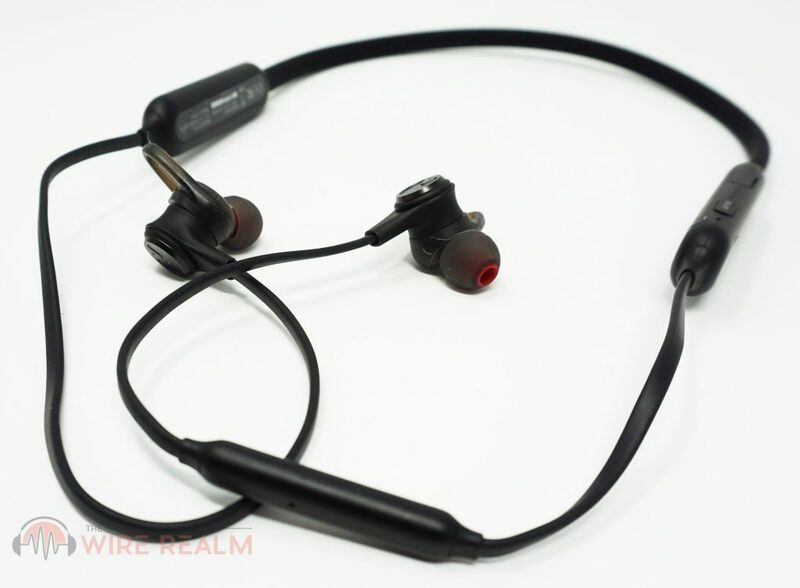 A last nifty feature in terms of build we noticed are that each in-ear headphone is magnetic, being that they can both attach to themselves for easy transporting. A nice little touch here. When first turning on the Linner NC50, we held the on\off button for about 3 seconds to finally hear a female voice state, “power on, pairing now, battery high” (make sure you charge it before hand, as they came in the box at pretty low battery. It only took about 3 hours to fully charge these). Once in auto-pairing mode after turning on the headphones, we immediately saw the headphones in our Bluetooth list titled, “NC50.” Once chosen, we hear the female voice state, “pairing successful” and voila, we were good to go. Immediately getting into our Spotify, we chose some music from different genres to get our listening hours under our belt. During use, we had a few features we noticed were significant to write here. For one when adjusting headphone volume, there’s a slight yet non-intrusive “beep” that occurs when we turn it up or down. This feature is actually quite convenient considering many Bluetooth headphones we’ve used don’t have this, and in our experience sometimes we press the volume button on accident and don’t notice it; however, the beep here will at least be an indicator if we do so. Simply push that button once for ANC, or another for ‘monitoring mode’. So how’s the Bluetooth range itself? We tested the distance and measured how far were able to get until we first heard our disruption. Thankfully it was pretty solid, coming in at a distance of about 30 feet. Pair this up with 12 hours of playing or 400 hours of standby time, and we have some standard “time” here when it comes to overall headphone Bluetooth tech. 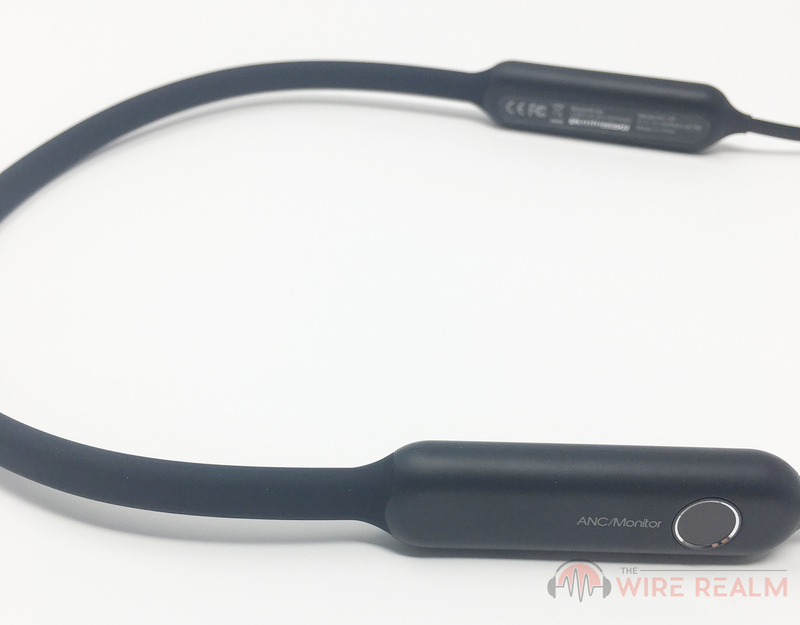 We know what you’re thinking — so what about the noise cancellation? We played some music first without any of the ANC on, and we could still hear ourselves typing and some outside noise in our office. Of course, activating the ANC will start to drain your battery, but that’s widely known and worth it if you really do need some noise reduction. After pushing that big button on the right control center once, we begun to see the effects of ANC. Just one push of the button will start Linner’s ANC (with a beep, not a voice) and we immediately noticed a difference in both the sound (it became slightly louder but more clear, too) as well as the inability to hear the ambiance around us (we used this in the office and used our typing and surrounding noise among others in the building as measurements). When the ANC was turn on, we could barely, just barely hear ourselves type, and definitely did not hear any of the noise in our office building whatsoever. We also took our dogs on a walk with the NC50 on a relatively busy street (at a pretty hectic time as well) with many cars around us and did not hear any of them. Our verdict — the ANC works very well with the NC50 at this price-point. Lastly, there is also a nifty “monitoring mode” we have at our finger tips here, and in order to active it I simply pressed that larger button on the control center (which also activates the ANC) and heard the “beep” to notify me of the change of setting. This lowers the volume about 50% immediately, coming in handy if you ever need to speak to somebody and don’t want to remove your headphones, or perhaps listen to what’s around you for a second if need be. Why not? 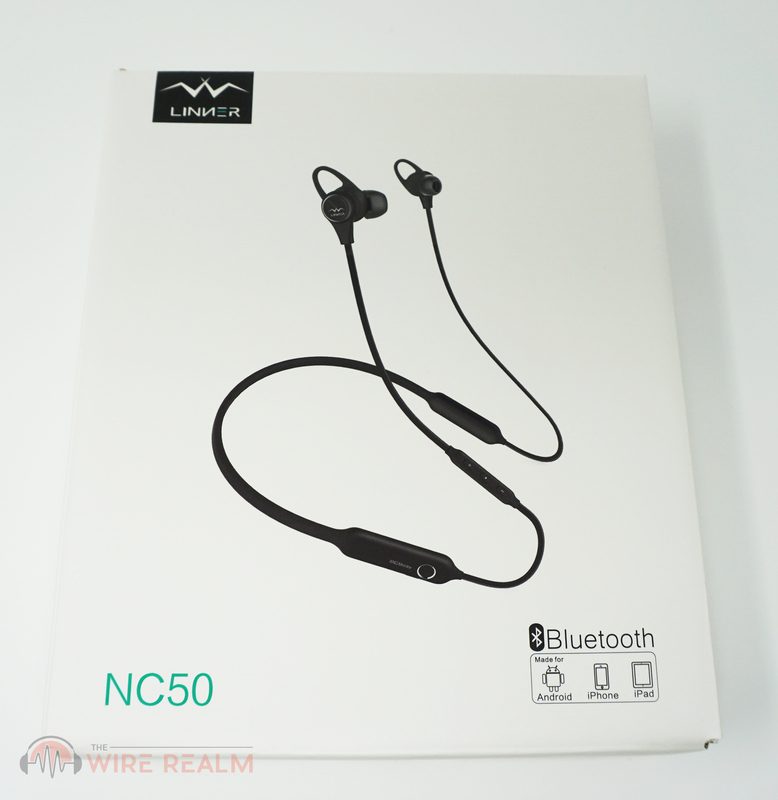 Of course, a nicely built pair of in-ear headphones with decent features and easy usage means nothing without some solid audio quality, so after listening to music for hours with these on, we were ready to jot down our thoughts and personal experience with the sound of the Linner NC50. 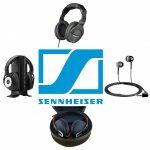 We tested the frequency range, bass and treble embellishments, and overall clarity with quite a few different genres of music to make sure it covered the bases in our “sound quality standards of headphones”, although still pretty subjective since these are only our human ears listening and not yours. Our first question: is the base embellished? Don’t get us wrong, some people like that and actually look for extra bass in their in-ear headphones (do you), but the NC50 in our opinion does not do so. The sound is not necessarily ‘flat’ like some in-ear monitors (of course, those are made for literal musicians in performing or producing), but we feel the NC50 do bring us a nice mixture and combination of lows and highs. 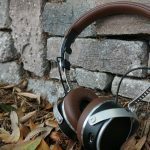 The mids in our opinion are not necessarily noticeable in the mix, but that’s usually the case with lower priced headphones because a lot of brands cannot fit support for mids in their smaller-sized drivers (especially in-ears). The frequency range here of 20 to 20 kHz is in our opinion the standard and should not be any slimmer in headphones, and the NC50 does just that. All in all, the sound is actually more clear than we had expected, considering the price-point of these headphones and competitors typically embellish bass to make it “sound better” even though for audiophiles, that’s just the opposite typically. The NC50 are great for a clear sound quality among lows and highs. 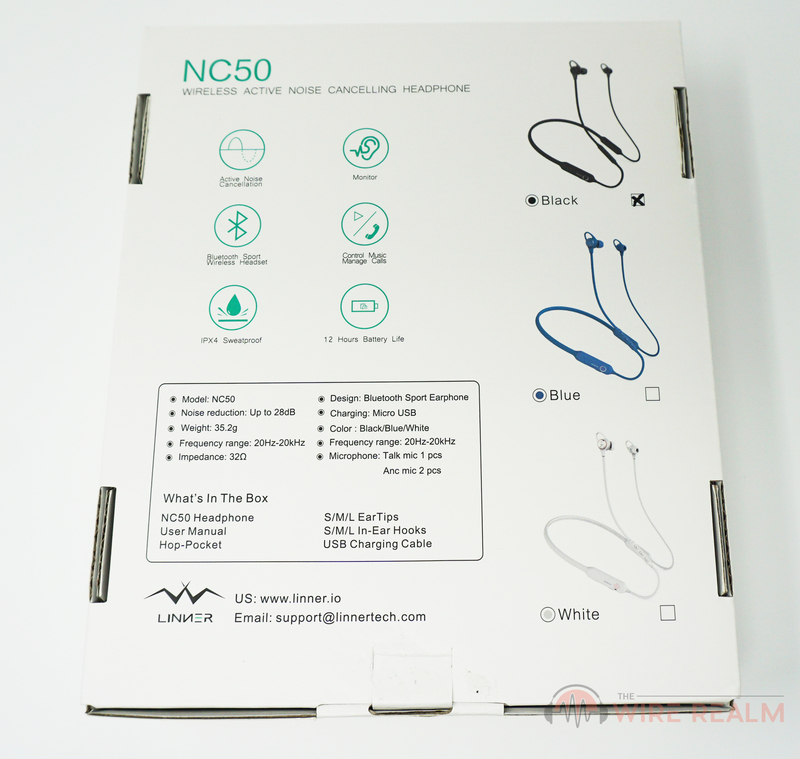 What’s in the NC50 box? Your intended use will be important here. We think the Linner NC50 are great for exercising (we’d stick to lifting weights or lighter activities, because running was slightly annoying for us and the headband bounced around a lot) and of course with many other ANC headphones, traveling. In particular airplanes or busy public transportation, the ANC will effectively keep us to ourselves, and we’re not sure about you but when we travel, but for us this is key if we need some privacy (especially after a long trip). Also, the fact that these in-ear headphones come in at $70 retail is great for those who don’t want to spend too much on a pair of “high-end” noise-cancelling headphones (the more popular and of course, higher-quality pairs come in at a whopping $200 or more). 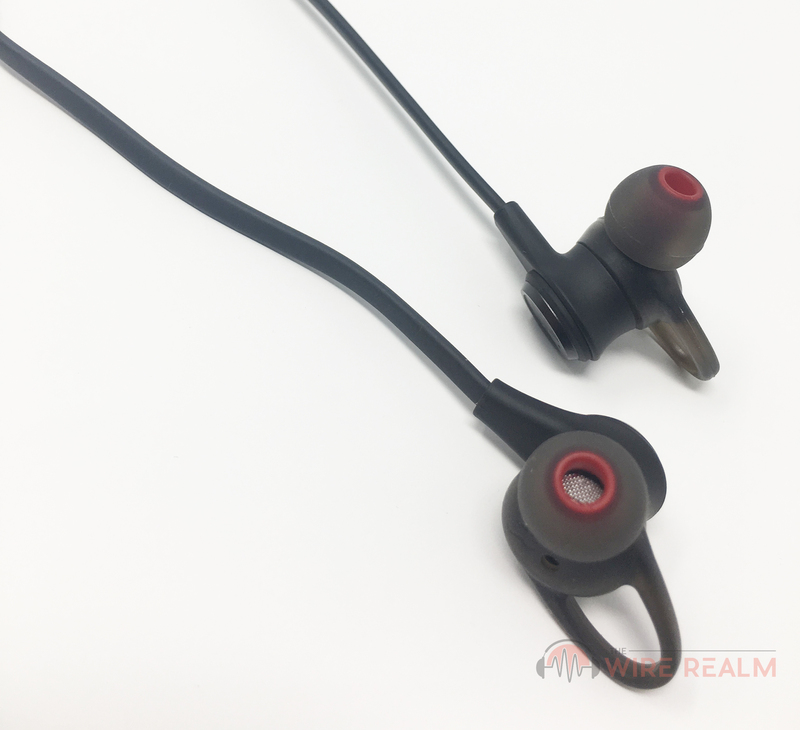 A con some may consider with these is the fact that they are indeed built relatively different from some wireless earbuds and in-ear headphones, since there’s this rubber “neckband”-like component to the fit. This is due to the fact that noise cancellation needs some room to be built-in, so it has to go somewhere. We’ll be honest at first when trying out noise-cancelling headphones, it was a bit weird to see, however after using them and merely placing it behind (or in front of, if you need) our heads, we got used to it. This is also a sacrifice with ANC — you need to have the cancelling mechanism (a little mic that captures the outside noise to cancel it out from your mix) somewhere. 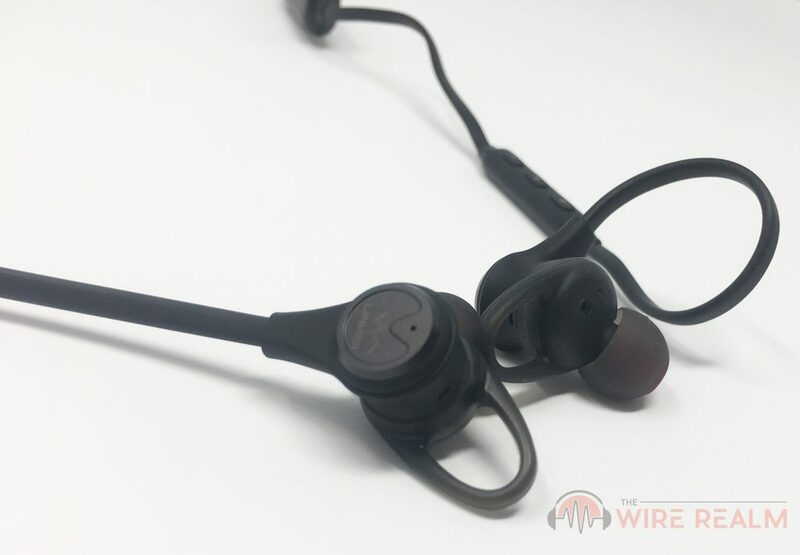 Plus, the in-ear headphones have to connect somehow, as opposed to something like AirPods where each in-ear piece is separate from one another. On the other hand, some other more expensive headphones have an entire noise-cancellation technology “pack” usually at the end of the cable so that you can fit it in your pocket with your phone, but keep in mind those are wired and have the flexibility to do so — you’ll have to pick your poison. With that being said, the active noise cancellation technology is great here, considering the price of these remaining under $100. To compare the ANC tech and the ability to “reduce noise”, this gives us about 28 dB, while the most popular noise-cancelling headphones in the game right now (QuietComfort by Bose) hits about 101.3 dB. Of course, the QC’s are about triple this price, so it’s difficult to compare the “quality” especially at this range. However, it does show us that scaling down from those $200 or more headphones will be worth it in this case if that’s what your budget allows. 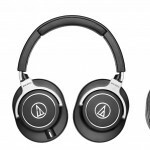 The NC50 give us a great solution for those who don’t want to spend hundreds of dollars on some headphones with noise cancellation technology. All in all, we love the Linner NC50 headphones if you’re one in to noise-cancellation technology (no, not noise isolation, but actual ANC that includes specific technology to capture outside noise and withhold it from entering into your ear canals — usually with tiny mics located somewhere on the headphones to capture outside noise to know what not to bring in). For the price of these there are really no complaints here, unless of course you’d like to spend a lot more money on better quality ANC in-ears. These are a great choice for those looking for a solid pair of budget-friendly noise-cancelling, sweat proof Bluetooth headphones to travel or exercise with, or those who just need some audio playing wireless versatility in their lives. Simply push that button once for ANC, or another for 'monitoring mode'.